Adjusting the valves on a 2nd generation (2001-2005) Suzuki Bandit 1200 is time consuming and sometimes frustrating because the service manual does a poor job of explaining the necessary steps. Set aside several hours because it involves removing the seat, tank, front body work, some items under the tank, spark plugs, head cover and signal generator cover. Also, the engine must be stone cold by at least 12 hours. There are some tricks to adjusting forked rockers and some omissions to the techniques in the shop manual. I highly recommend buying the $5 US tool #09917-14920 valve adjuster driver, a small tool that mates with the tiny square head of the screw adjusters and is extremely useful in holding the screw while you tighten the lock nut. If you don’t have it, you’ll have a hard time maintaining the proper lash as you tighten. Of the following, only the signal generator gasket demands replacing and even then, many have gotten away with not doing so. Each rubber gasket is reusable so long as it remains spongey/pliable. The four metallic washer gaskets should be inspected accordingly. In short, order any of the following that you don’t already have. When a new gasket is needed (and eventually that will be the case), you’ll have it’s replacement with you, ordering another upon installation. Much of what you’re about to read with regards to bike prep applies strictly to the faired “S” type Bandit 1200. However, plenty of the instructions are universal to faired and naked versions alike. We leave it up to you to decipher what’s what with regard to plastics versus otherwise. 2) Remove the gas tank by unscrewing/removing the petcock knob and two securing bolts towards the seat latch before then disconnecting the fuel/vacuum hoses on the left side and fuel level meter + breather/overflow hoses on the right side. 3) Remove both mirrors by rolling back their elastic covers and unscrewing their two Allen bolts. 4) Remove the “V” shaped upper plastic from the front fairing by removing the two phillips screws (towards the top of the dash) and two Allen head shoulder bolts on front before pulling diagonally forward/downward, “popping” it out of the fastener insert. 5) Remove the windshield by removing the two screws at it’s left and right base before flexing outward from the top and lifting away. 6) Remove the plastic “chin curtain” from the lower/center fairing by first compressing the four push-pin connector buttons and removing the push pins. Next, unscrew and remove the two (upward pointing) Allen head shoulder bolts. 7) Disconnect the turn signals. If the wires are seemingly inaccessible, disconnect one side of the fairing first (#8) and suspend it in one hand while accessing the wire connection with the other. 8) Remove the left fairing by removing the two large and two small Allen head shoulder bolts located (from side perspective) at the top right, middle right, center base and top left. Much like the “V” shaped upper plastic from the front fairing, this part must be “popped” out (carefully) to the direct left of rider position (not diagonally). 9) Remove the right fairing using a mirror-image process that’s identical to step #8. 10) Remove the ignition coils, noting the position, routing and connections of the wires. A few shots from a digital camera will likely prove useful. 11) Remove the left/right fairing mounting braces from the frame just above the head cover. 12) Disconnect the breather hose as well as the breather cover (four bolts), making sure to treat the thin metallic gasket underneath with care. 13) Disconnect and remove the spark plugs before lightly packing shop rags into their respective tunnels. This helps insure that engine bits don’t fall into the combustion chambers. 14) Disconnect the oil head cooler hoses from the head cover by loosening their Allen head bolts. 15) Prepare to remove the head cover by removing the ten Allen head shoulder bolts in a criss-cross “X” pattern. Two of these screws are seemingly hidden due to their yin-yang position at the front/center-left and back right/center-right. Next, remove the four hex bolts using an outward to inward pattern. Be sure not to lose the small metal gaskets under each of these bolts! 16) Gently lift the head cover and feed it from left to right. If it’s stubborn to lift, use a cloth and wide flathead screwdriver to gently twist it open. Look underneath as you guide the plug towers over the timing chain. You can easily lose one of the small gaskets at the base of these towers. Also note the two removable “keys” that keep the head cover and it’s gasket properly aligned. They’re located to the front/left and rear/right corners of the head itself. Be sure not to lose either, as each might either remain in place or lift away with the head cover. 17) Remove and clean the head cover gasket (strip off any remaining silicone sealer) and the mating surfaces on the head cover. You can reuse this gasket as long as it’s pliable. 18) Remove the right side generator cover (so that you can crank the engine into adjustment positions) by removing it’s five Allen head bolts. If you’re careful in peeling the gasket off, you’ll be able to reuse it (once) with a permatex silicone gasket maker (blue or ultra blue) coating. Rotate the crank forward (clockwise) with a breaker bar or large wrench (19mm) on the signal generator nut (right end of crank under removed cover) until the cam marks line up with the head surface (horizontally) on the outside of each cam (the marks will be “pointing” away from each other). 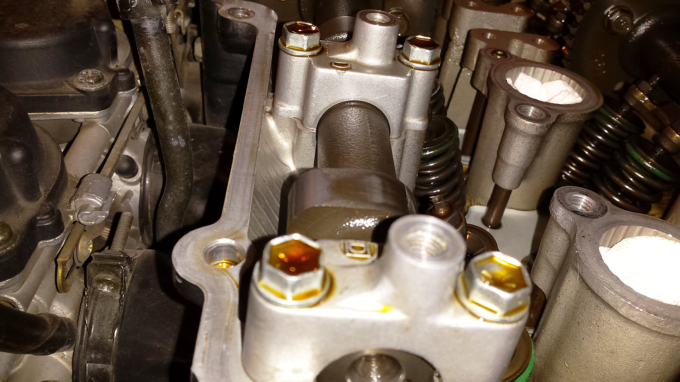 In this crank position, you can adjust the intake valves (0.004 – 0.006″) for cylinders #1 and #3 and the exhaust valves (0.007 – 0.009″) for cylinders #1 and #2. Let’s begin! Check the existing lash on each side of a rocker with one feeler gauge. If the two sides of one rocker differ from each other by 0.001″ or more, or if either is out of spec, you must adjust one or both valves on that rocker. To adjust, loosen the locknut and adjust the screw with the $5 driver you bought until the desired lash is there. Tighten the locknut gently as you hold the screw with the driver. Repeat on the other side of the rocker if necessary. Check the lash on both sides (simultaneously) of a rocker (with separate feeler gauges) to make sure the lash is in spec when the rocker isn’t rocking sideways on the rocker pivot shaft. If it’s out of spec (probably too tight, which is bad), start over with the step immediately above on both sides and use a different lash as your goal (looser if the final lash was too tight, tighter if too loose). Torque the locknuts with a torque wrench to 7.0 lb-ft or mechanically “snug” and recheck the lashes on both sides simultaneously as in the step immediately above (“check the lash on both sides”). Repeat this procedure using the appropriate feeler gauges for intake (0.005″) and exhaust (0.008″) valves for all valves to be adjusted at this crank position. Remember that it’s better to have them slightly loose than even a little too tight. Loose = noise, slight wear; Tight = valve burn, seat burn, head machining, money, headache, etc. Rotate the crank forward (360 degrees) until the marks on the cams are horizontal but “pointing” toward each other (i.e. on the inside of the cam journals). Remember to take the inexact nature of these markings into consideration as mentioned above. use the same adjustment procedure as before. Rotate the engine through each check point again and recheck/verify the lash on each rocker. Use a thin coating of permatex silicone gasket sealer on the signal generator cover gasket (both sides). Even if you buy a new gasket, you still need to use sealer at the crankcase split points on the engine’s side. Put a small bead of gasket sealer on the head at the corners of the head cover gasket mating surface and at the cam journal “dips”. Do the same on the head cover. Thoroughly clean and dry each of the “Mickey Mouse” gaskets that seal at the spark plug towers underneath the head cover. You might optionally add a bit of Gasgacinch to the head cover’s recess slots before securing the pertinent gasket in it’s designated location. Let these dry well before installing everything because it’s a big challenge to maintain their position while suspending them over the timing chain in attempts to reinstall the head cover. It’s better to place these gaskets into position on the cover than on the head because the head surface is flat and thus easier to lineup and secure. You may also want to put additional sealer onto the head’s spark plug tower mating surfaces just before reinstalling the cover. No sealer is required on the pseudo-gasket under the head cover breather. The one and only purpose of the ten Allen head shoulder bolts is to compress a fitted and pliable rubber gasket material to the point that oil doesn’t escape from the head. As time goes on, the rubber becomes less pliable and eventually the shouldered part of these bolts meets metal before compressing the gasket to any noticeable degree. Continuing to tighten/torque now ceases to secure the head cover any further and instead begins stripping the threads from their receiving outlet. The head cover union bolts, which are to be installed before the others using an inside-inside-outside-outside pattern, call for 11.5 lb-ft, a solid value when applied respectfully using minimal force. As for each of the others that are engine-specific, imagining five lb-ft before going to “snug” is a safe bet. What’s more, I’ve never seen a leak from this semi-gentle effort. Now that your engine’s buttoned back up, don’t be alarmed if your valves are slightly noisier than before, especially if it’s the initial adjustment at break-in. You’re more likely loosening the adjustment (due to valve seating and seat wear) than tightening a sloppy lash (due to valve tip, adjuster tip, or rocker arm wear). This noise is good (keep telling yourself that). It lets you know you’re not burning your valves or seats (very bad). It’s now that your obsessive rechecking of clearances and careful torquing of locknuts provides peace of mind. If you own a faired “S” type, now’s a good time to cover all points of contact between the fairing and screen assembly with foam tape to eliminate the buzz that many experience at over 4k rpm. What’s Your Valve Adjustment Procedure? Different motorbikes require different maintenance! What makes your process different and why? Your input is invited. Post an article! Excellent tutorial. More people than you realise will have appreciated it. You mentioned it was for 2001-2005 models. I assume the procedure is the same for an 06 model. I will cross reference any possible queries with my Haynes manual. I have my 2006 1200N Bandit, feelers, tool, sealant, gaskets etc. and very soon will be attempting my first Bandit valve check. As I am at it I will also replace the cam chain tensioner spring. I imagine it will take me a while as I like to take my time to ensure I get it right. Any Bandit later than 2005 is an injected machine. I believe that with your 2006, you’ve entered “generation three” (mark iii) territory. If I’m not mistaken, those run shim-under-bucket which is more complicated. The short of it is, the above instructions won’t be of any use to you as they’re intended for 2001-2005 “generation two”, carbureted engines with screw-type valves adjusters.